Joe Landon described the 10 year history of the American Bank of Oklahoma which opened for business April 1, 1998. On the wall behind Joe (in the bank's community room) was a photo of the first store in Collinsville's current location in 1900. Joe also discussed all of the positive change that has occured in Colinsville in the past 10 years including a flurry of construction in progress. CHS Chorus members arrived at American Bank of Oklahoma Thursday to entertain the Chamber (below). 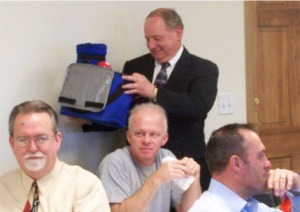 Bill Roten (of RCB Bank) couldn't help but grin having won American Bank's door prize at the monthly Chamber meet. Bank of the Lakes was also well represented at the Chamber gathering. 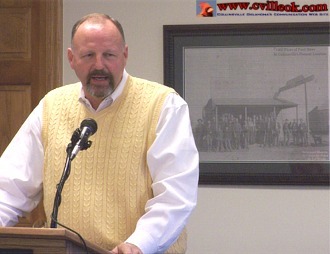 Bill Thomas remined everyone to support the Collinsville Education Foundation's annual golf tournamant (which will be June 12 this year) by signing up for teams or hole sponsorships. 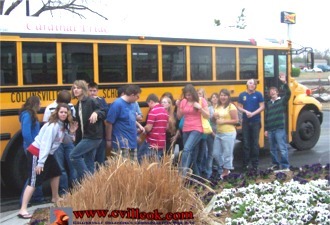 The photo above is from 2006. The CHS Chorus announced their May 5th & 8th presentation of "Into The Woods" at the CHS gym (7pm). 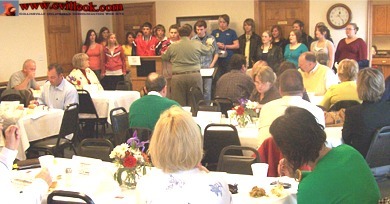 The choirs will also hold their annual spring concert and coronation April 17th.